GM 2 – Giorgi Kacheishvili – He has returned to play in the NY Masters just recently and has only managed to come out on top once thus far. However his great understanding and feel for chess will surely give him a great shot this week. Let’s not forget that his FIDE rating is just a few points away from 2600! GM 3 – Alex Stripunsky – Holder of the longest streak of consecutive NY Masters victories. Stripunsky won the title 5 consecutive weeks from September 3 to October 1. Perhaps he plans to start a new streak tonight? GM 4 – Roland Schmaltz – It’s almost a joke that he is number 4 rated, considering he has the highest winning percentage of anyone in the NY Masters, by 7 percentage points. Roland’s lightning fast speed and great instincts always give him a great chance to win. GM 5 – Pavel Blatny – Pavel has had a mixed history in the NY Masters. In his first ever event he finished with only 1/4, but rebounded some time later to score a very impressive 4/4, with wins over GM’s Yudasin and Najer. His uncompromising style and unorthodox openings always make his games fun to watch! I have profiled all of the GM’s but have not even mentioned last week’s champions! IM’s Irina Krush and Pascal Charbonneau, have returned this week to defend their title, although it’s clear that it will not be an easy task. We had two other IM’s in the field, in IM Boris Kreiman and Jay Bonin, and you can be sure that they hoped to make some noise too. Let’s get to the action, and there was plenty of it this week, as we had quite a few action packed games! 1. Krush – Yudasin SEE BELOW! Unlike last week, the first round almost held to form. 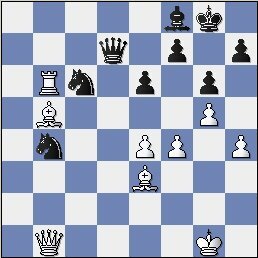 I say almost, because D’Arruda managed to draw Kacheishvili with the black pieces, not an easy task by any means. Kacheishvili is off to his second consecutive slow start, as he lost to Irina Krush last week in the first round. Note that I was not present during this week’s NY Masters, so I cannot give much detail on the other games, although I could make stuff up? 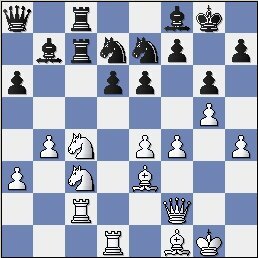 For instance Charbonneau was down a queen against Zimbeck out of the opening, but managed to trick him in a knight fork later on to regain the queen. 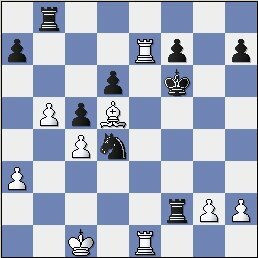 In a mad time scramble Charbonneau found a fantastic underpromotion to a bishop, thus avoiding all stalemate tricks and scoring the victory. Action packed chess here going on here! 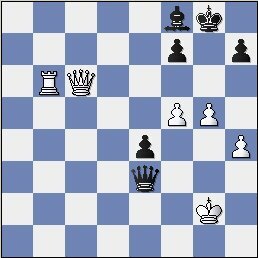 White is castled queenside yet the pawn shelter around blacks kingside is very weak. Which attack will succeed? Irina’s forces are attacking from every angle!! Yudasin has to keep defending and defending! And now the bishop joins the party! Strong GM’s always have a feel for when it is right to bail out into a worse yet tenable endgame. Yudasin is exhibiting this skill here, as the white pieces are attacking too dangerously, to allow queens to stay on the board. The point! 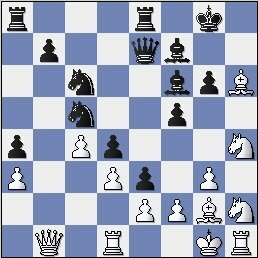 Black has lost a pawn, but after 28.Bxc8 Re3, black will have an awesome square on d4 for the knight. Yudasin was hoping that this would be a big enough of a factor to compensate for lack of a pawn. Black’s pieces had become too active, and thus Irina allows Yudasin to achieve a draw. A fun matchup and an unenviable first round pairing for top seed Yudasin. 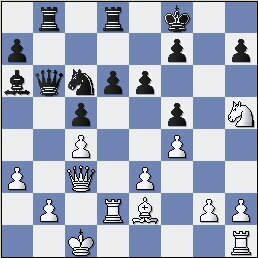 Not 37.Kd1 because of Rd2 checkmate! 2 Charbonneau – Schmaltz SEE BELOW! Already in round 2, we had some all star matchups. GM vs GM on board 1, last weeks champ vs highest lifetime NY Masters % on board 2 and two hopeful IM’s on board 3. Blatny beat Stripunsky with the black pieces, and impressive feat, and Kreiman knocked off Jay Bonin. Yudasin and Kacheishvili got back towards the top of the bracket by knocking off D’Arruda and Krush respectively. Kacheishvili lost to Krush in last week’s event, but with this win he eliminated any chance for Irina to repeat as champion. A fine move by the Canadian champ! 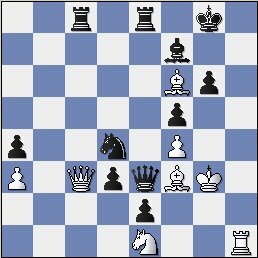 This simple retreat makes black’s knight on a5 look quite foolish. Where is it planning to go?? 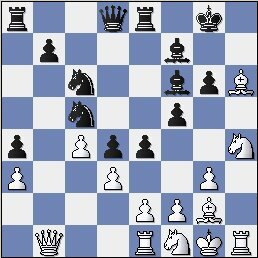 GM Schmaltz thought that knight was pinned, but he was wrong! If 28.Nxd6 Rxc3 29.Nxc8! Rxc2 30. Ne7 CHECK, winning an exchange and the game. A very cagey move! Schmaltz sacrifices the exchange to confuse the issue a bit. 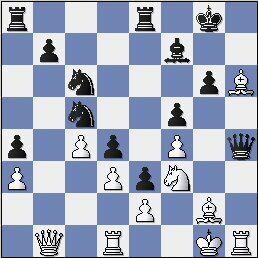 White has the knight fork on b6, but sometimes it is easier to win with an extra pawn, than it is with an exchange. And here we go! As stated earlier, the black queen is eying g4! 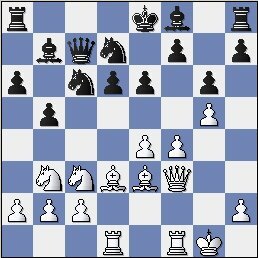 Oh how desperately Pascal would love to move his pawns backwards……the black counterplay has begun! And now blacks counterplay is too strong! 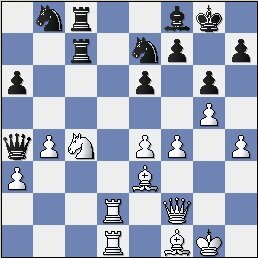 White’s extra exchange is meaningless, with his king wide open, without the protection of any pawns!! White is now just looking for the best way to draw. Roland is fishing for some winning chances…. But he couldn’t find any! An exciting fighting game by both players! 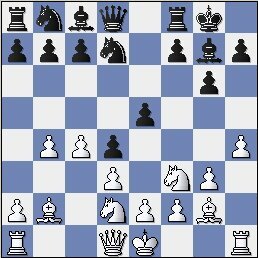 Charbonneau got the early advantage, but Schmaltz showed great resilience and caused too many problems for Pascal to handle in action chess. 1 Blatny – Kreiman SEE BELOW! Apart from the slugfest on board 1, there were four other strong players vying to get back into the thick of things. Schmaltz and Yudasin was the heavyweight matchup in this round, and Schmaltz has owned Yudasin in the past. Schmaltz has defeated Yudasin 3 times and only drawn once. Yudasin would do better this time as they fought to a draw. Kacheishvili regained his terrific form with the white pieces, as he ended Charbonneau’s dream of a repeat championship. Now for the battle of the undefeateds…..
Blatny is not feeling so peaceful after all! He lunges at Kreiman's kingside! Some players would be worried about getting mated as black, but Kreiman is confident that his king is safe and simply proceeds with central counterplay. To all my students that I tell to castle early in the game, please ignore this game. Kreiman is counterthrusting in the center of the board! It seemed like Blatny was on the attack a few moves ago, but now it has completely turned around and Boris Kreiman is dreaming about the perfect 3-0 score. Look at how white’s pieces are completely bottled up! Kreiman keeps pushing and pushing. Maybe the king was safer in the center after all? Can Blatny defend this? 31.f4!? 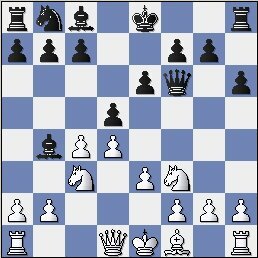 Bxh4 32.gxh4 Qxh4 33.Nf3!? The point! It turns out the black queen is trapped between e2 and f2. 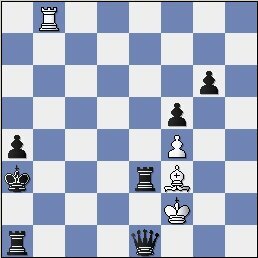 White can now simply force a draw by shuttling the rook back and forth. 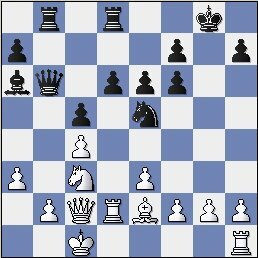 Given the situation on the board, and blacks powerful e3 pawn, a draw should be on the horizon. WHOAAA, Pavel seems a little too optimistic today!! 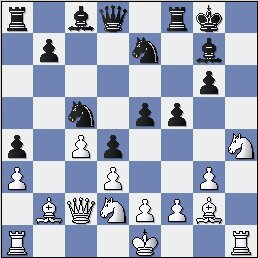 Overlooking a fantastic shot with 38.Ng5 Kh6 39.Bf3, trapping the queen on e2. 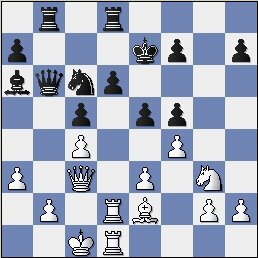 However after 39...Qxf1, black seems to have ample compensation for the queen, with that monstrous protected passed pawn on e3. 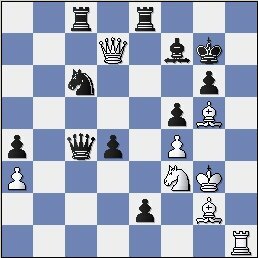 After 38.Bg5, white’s position seems simply lost to me. 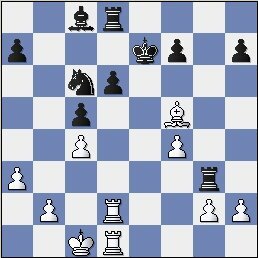 Blatny has made it so that now after Re1, black replies Qf2 check! This lone queen cannot cause enough trouble to counteract all of black’s trumps. Kreiman has clarified the issue and the win seems well on the way. Whites piece’s are around the black king, but there is really no way to pose any serious danger. Ooooh free queen? Ok, not really, if 49...Rxc3 50.Rh8 mate! 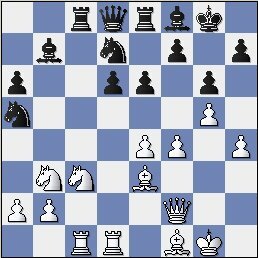 A very clever deflection, forcing the trade of queens, at which point the pawns on d3 and e2 look MIGHTY strong. Looks like black has the advantage...Blatny resigned. However once again I have to congratulate both contestants on a hard fought and exciting struggle! Blatny probably should have conceded to the draw, but his bravery was well appreciated by all of the fans watching at the Marshall and on the ICC. Now it seemed that IM Boris Kreiman, whom I didn’t even profile at the start of this report, had great chances to be the winner of this tournament! 1 Kreiman – Kacheishvili SEE BELOW! The key game in this round was on board 1 as the best anyone else could hope for was a tie for 2nd place. Yudasin and Schmaltz, both great champions of the NY Masters, were able to move to 3 pts, with victories in Round 4. Boris Privman scored the U 2400 prize with a victory over Rafal Furdzik. Now it’s time to see the action on the top board. This was a HUGE game, as if Kacheishvili were to win, he would win clear first place, whereas if Kreiman could draw or win, clear first would go to him. I’m going to provide a spoiler and tell you that this game was a real barn burner, so buckle your seat belts, get out your Fritz engine and get ready for the ride of your life!!!! A puzzling decision. Sometimes a quick draw makes some sense, at least monetarily, however in this case it makes absolutely no sense to me. Kacheishvili received $70 for the draw, meanwhile would have gained $300 for a win! It would seem like it’s worth it to risk $70 for a chance at over 4 times as much money. I would play for the win here without even a second’s hesitation and I’m a weaker player than Kacheishvili! Boris must have been delighted, as this draw guaranteed him clear first place. An impressive show by Boris, to finish in first place on top of 5 GM’s. There WILL be a tournament next week, despite the Amateur Team East. Good luck to everyone whom is playing in Parsippany, and I will see you all next week, except this time I will be present and playing!